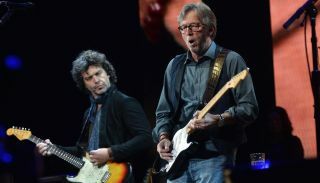 Eric Clapton has announced the fifth installment of his Crossroads Guitar Festival. Set to take place at the American Airlines Center in Dallas from September 20-21, the festival will gather together a jaw-dropping list of blues-guitar greats for two nights of music. All proceeds from the event will go towards The Crossroads Centre in Antigua, a substance-abuse rehabilitation facility founded by Clapton. In addition to the concerts, the Guitar Center Festival Village will be featured on Victory Plaza adjacent to the arena. Ernie Ball, Fender, Gibson, Martin, PRS and more will host interactive exhibits where electric guitar enthusiasts can plug in and play new products and classic favorites. In addition, the Guitar Center Festival Village Stage Presented by Ernie Ball will host master guitar clinics and solo performances by main stage artists, next generation guitar virtuosos and special surprise guests. The Guitar Center Festival Village will be open from 12pm to 8pm each day and is free to all ticket holders. This year's installment is the fifth for the festival, following those in 2004, 2007, 2010 and the most recent edition in 2013. You can check out the full lineup below. For more info on the festival, head on over to crossroadsguitarfestival.com.